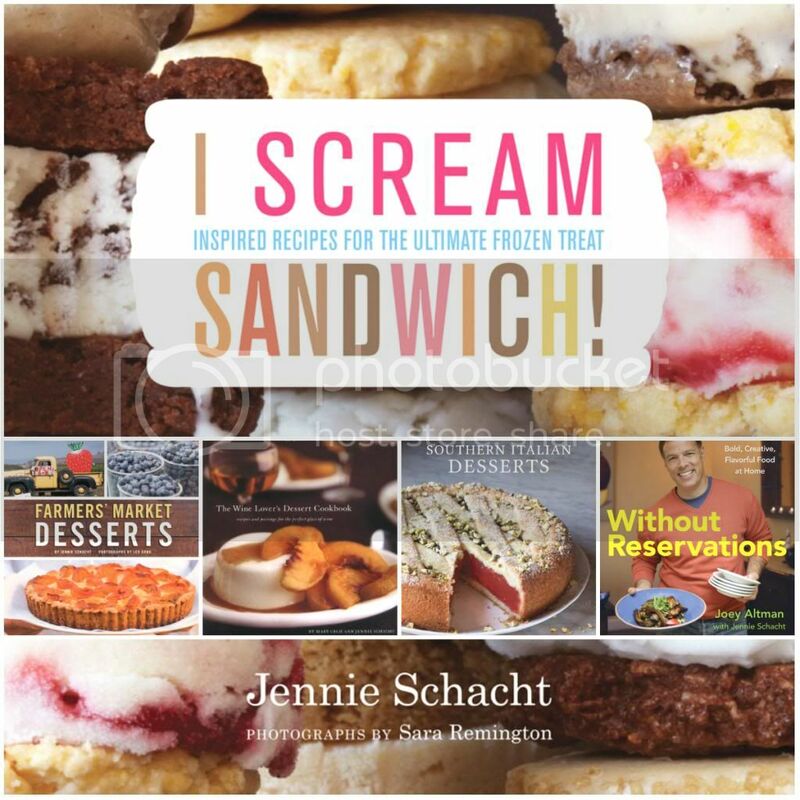 December is the time for all things chocolate and peppermint, and I’ve got you covered with the Winter Holiday ice cream sandwich from my book i scream SANDWICH!. They’re made by stuffing fudgy brownies with mint chocolate chip ice cream. If you’re up for a holiday project you can make every element yourself: the brownies, homemade ice cream with homespun chocolate chips in the Italian style of stracciatella, and even cute cut-outs featuring holiday themes. If time is short, however, there’s no need for competitive ice cream sandwiching. Use a brownie mix and the Silpat Entremet baking pan (you can use it with the homemade recipe too, of course) for brownies that neatly release without effort or fear. (Disclosure: my thanks to Silpat for sending me the Entremet to try out.) Then purchase your favorite mint chocolate chip ice cream. Again using the Entremet as a holder, construct the sandwiches following the instructions below, freeze, and cut into squares. You can even cut the squares in half diagonally, sandwich style, for serving. When using the Entremet, you’ll want to take care not to cut directly on it. I removed the brownie slab before cutting it in half, and again removed the frozen sandwich block before cutting it into squares. Unmold the brownie slab onto a flat cutting surface and cut out two of the same shapes for each sandwich. Wrap and set aside. When the ice cream comes out of your ice cream maker (or after softening store-bought ice cream), spread it evenly into the Entremet and return to the freezer. 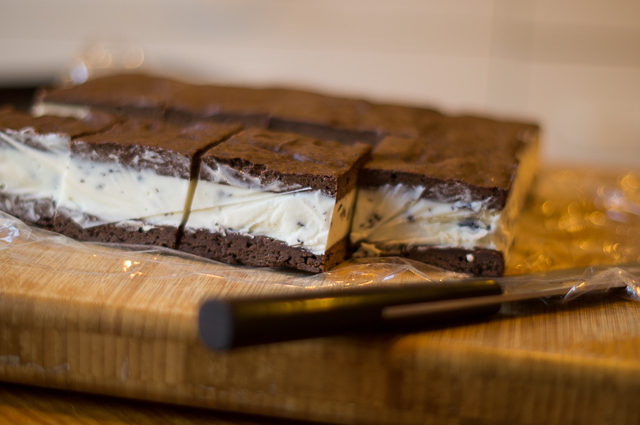 After it has frozen hard, unmold the ice cream onto a cutting surface lined with plastic wrap or waxed paper and use the same cutter to cut out half as many ice cream shapes as you’ve cut from the brownies. 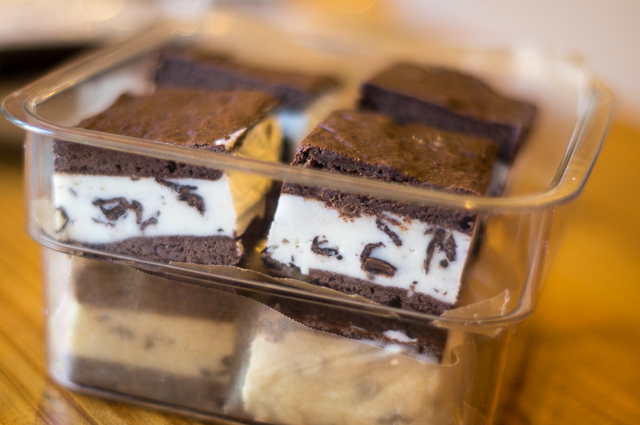 Use a small offset spatula to carefully transfer an ice cream shape between two brownie bottoms until you have used all of the ice cream and brownie shapes. Have an airtight container lined with waxed paper ready in the freezer, and get ‘em right in there as you make ‘em, before they begin to melt! Whether you cut your sandwiches into squares or use cutters, for extra panache, crush some candy canes or other peppermint candies and use them to roll the edges of the sandwiches. Try making these Winter Holiday sandwiches and see for yourself just how uplifting an ice cream sandwich can be in the depths of winter. This sandwich makes a festive addition to the holiday table, especially when cut into holiday shapes with ice cream sandwich molds and dressed up with crushed candy canes. For cool, minty flavor, I much prefer pure peppermint oil (I use LorAnn brand) to peppermint extract, or even fresh mint. Whisk ½ cup of the milk with the sugar, golden syrup, tapioca, and salt in a medium saucepan until no lumps remain. Stir in the remaining 1½ cups milk and the cream. Heat the mixture over medium-high heat, stirring with a heatproof spatula, until it begins to steam and slightly bubble at the edges. Adjust to a simmer and cook, stirring constantly, until the mixture thickens to the consistency of a cream sauce, about 3 minutes longer; do not fully boil. Transfer the mixture to a metal bowl set over a larger bowl of ice and water. Stir occasionally until the mixture is cool, taking care not to slosh water into the bowl. Stir in 4 to 5 drops of peppermint oil (or ¾ teaspoon extract), then cover and refrigerate until very cold, at least 2 hours. Transfer the bowl to the freezer for the last half hour before spinning it. Freeze the mixture in an ice cream maker according to the manufacturer’s directions. While the mixture spins, melt the chocolate and vegetable oil in the microwave or in a small saucepan over low heat until you can stir it smooth. Stir in 2 to 3 drops of peppermint oil (or ¼ teaspoon extract). Let cool to room temperature, keeping it fluid. Transfer the ice cream to a chilled container, cover, and freeze until firm but still spreadable, about 4 hours. Preheat the oven to 350°F with racks in the center of the oven. 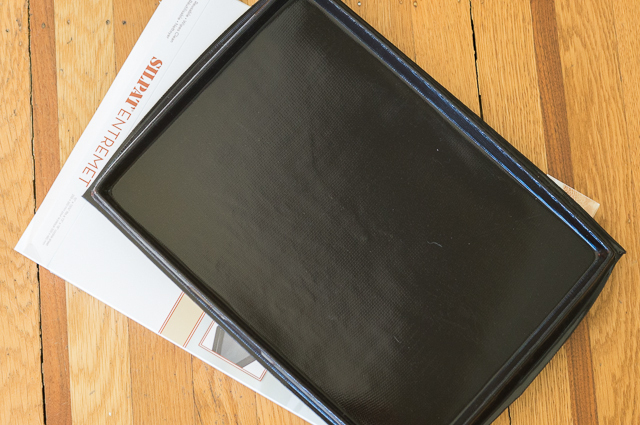 Line a 9-by-13-inch baking pan with lightly oiled parchment paper or foil to cover the bottom and run up two sides to the top of the pan as a sling to later aid in lifting the brownies from the pans, or place an unlined Silpat Entremet on a flat baking sheet. Melt the chocolate and butter in a medium metal bowl nested over a saucepan holding about 1 inch of simmering water. Remove the bowl from the heat and wipe the bottom dry. Whisk the sugar, espresso (if using), vanilla, and salt into the melted chocolate. Whisk in the eggs one at a time, mixing each until smooth. Stir the baking powder into the flour, then stir the mixture into the batter with a spatula just until no white streaks remain. Cut the cooled brownie layer in half the short way, wrap the layers in plastic, and freeze until the ice cream is ready, or at least 1 hour. 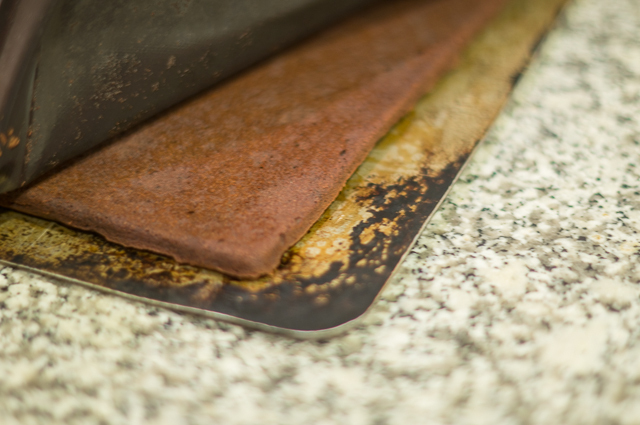 Line the same pan you used to bake the brownie with plastic wrap, extending it well beyond the edges on all four sides. 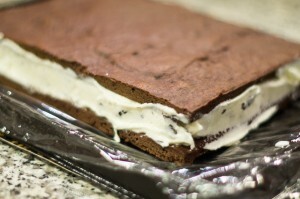 Place one brownie layer top-side down in the pan and spread ice cream over it in an even layer. Top with the second brownie layer, top-side up. Press firmly to evenly distribute the ice cream. Use a small offset spatula to smooth the edges. Wrap the whole block tightly in the plastic wrap and freeze until very firm, at least 6 hours or overnight, for easiest cutting. 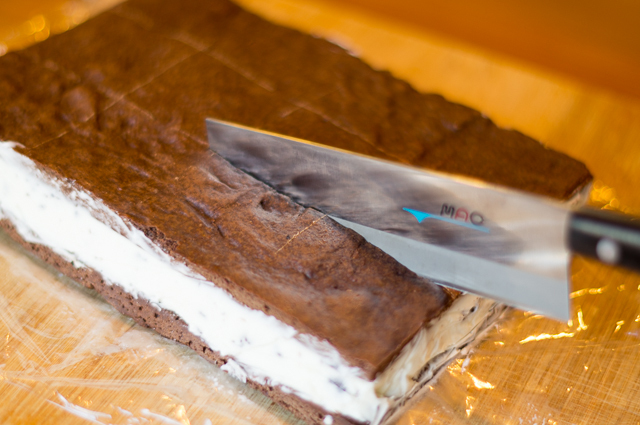 Once firmly frozen, remove the filled brownie from the pan, unwrap, and place on a flat cutting surface. Use a sharp, heavy knife to cut the block into 4 strips in one direction and 3 in the other to form 12 sandwiches, dipping the knife into hot water and wiping it dry between cuts. Alternatively, form sandwiches using ice cream sandwich molds according to the manufacturer’s directions. TAKE IT EASY: Use a brownie mix, adding 1 teaspoon instant espresso granules, if desired. Bake the brownies in a 13-by-9-inch pan until still slightly moist at the center, about 5 minutes less than specified on the box. Use store-bought mint chocolate chip ice cream, or mix 4 to 5 drops of peppermint oil and mini chocolate chips into softened vanilla or chocolate ice cream. DRESS IT UP: Roll the sides of the sandwiches in crushed candy canes. 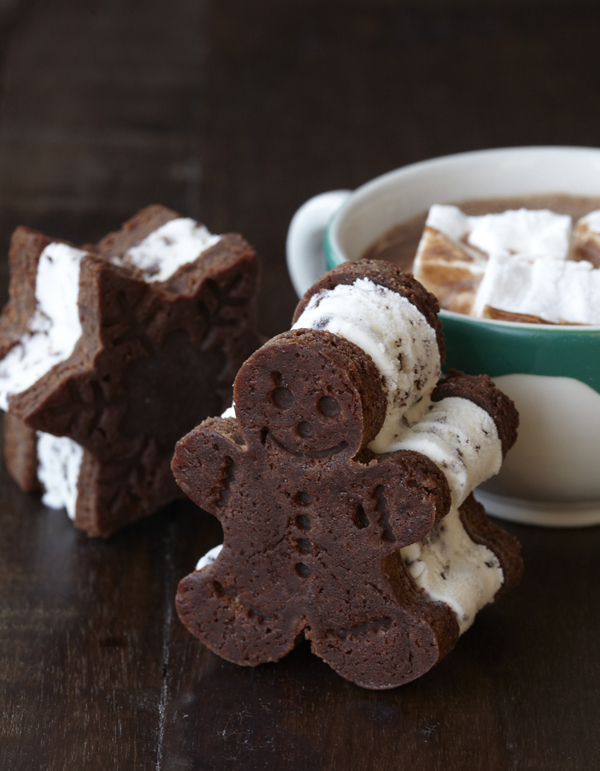 Serve with minty hot cocoa topped with marshmallows. Hard choice but if I had to pick right now, it would be chocolate cookie with vanilla ice cream and a little bit of caramel. That’s a nice twist on a classic! Another one you might like in my book (if you like coffee): Wake-Up Call: espresso caramel swirl ice cream on espresso fudge brownies. The caramel is made with espresso (that’s probably obvious) and is swirled into vanilla ice cream. A very popular choice. Thanks for entering and spreading the word–good luck! I love those store bought chocolate cookie wafer with the vanilla ice cream. Those thin chocolate cookies are so addicting! That is a fast and excellent route to an ice cream sandwich! I’m a sucker for the plain old vanilla between chocolate cookie combo, but I also like chocolate chip cookies with vanilla ice cream. Nothing wrong with tradition! The first recipe in my book is called Pure Nostalgia — vanilla ice cream on soft chocolate cookie bars. The kind that stick to your fingers a little when you eat them, so you get to nibble it off. They’re still one of my favorites. That sounds like a good combination. Most anything goes with chocolate chip cookies! Gingersnap wafer + lemon gelato! I agree! Ginger and lemon are a match made in heaven. Check out the Lemon Zinger ice cream sandwich in my book: lemon ice cream on soft ginger cookies. One of my favorites! Had these last night after a pizza. Super! Peppermint ice cream puts them over the top perfect for Christmas. As hard as it is, let them warm up a bit after taking them from the freezer, maybe 5-10 mins or so–that creates an olfactory party of minty aromas. And who doesn’t like that?! So glad you enjoyed these. That’s a great tip — your patience for just a few minutes is rewarded when enjoying ice cream sandwiches! I love mint chocolate chip in anything! It’s hard to beat that combination! I love mint chocolate! You make ice cream sandwich making look so easy. I am not sure what a silpat intremet is but I can’t wait to try it out! Thanks for this awesome giveaway! I agree–you can’t beat chocolate + mint! 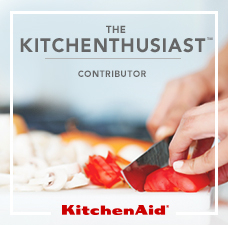 The Entremet is the pan you saw in the post — a non-stick silicone pan you place on a baking sheet. Worked perfectly for me for this recipe. I hope you’ll try making these! 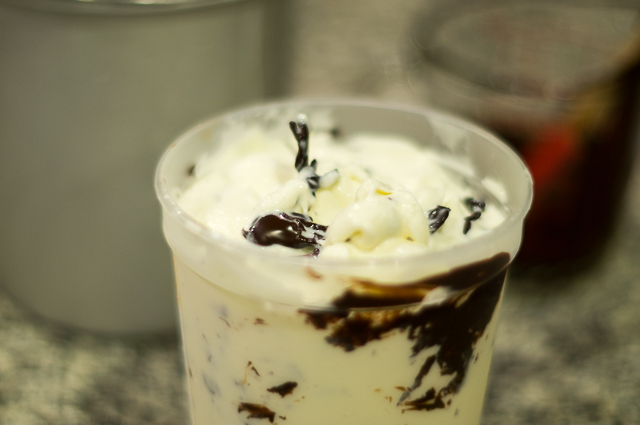 Brownie with mint chocolate chip, dipped in hot fudge! 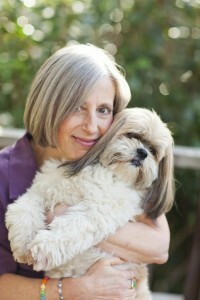 What a great article Jennie and I love the giveaway! I haven’t heard of Entremet and it sounds like a fantastic new piece of equipment I need, LOL. Your photos and the sandwiches are beautiful and making me hungry!! Thanks, Jane. As always, I was skeptical but the Entremet was terrific to work with. When I inverted the brownies it peeled write off. A swipe with the sponge and done! I hope you win one! Hi Jennifer. That sounds like a great combination — I’ll have to try that. For a sandwich what kind of cookies (or other holder) would you put it on?